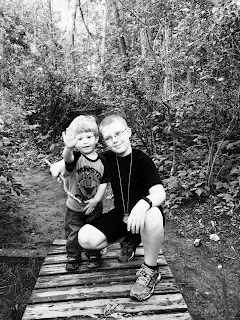 Matt, Davis, Tyrion and I all love to spend time outdoors so we typically spend a lot of time in the warmer months exploring local walking trails. The problem is we tend to stick to the same familiar spaces and while it's still enjoyable, it's not nearly as exciting as exploring someplace new. So our goal for this year is to explore more of the nearby trails. This goal was inspired by a book Matt was given by a co-worker which has information on a variety of trails in Haverhill. We plan to work our way through the book this year. Last weekend we started this exploration process by trying out a new trail around our favorite lake. 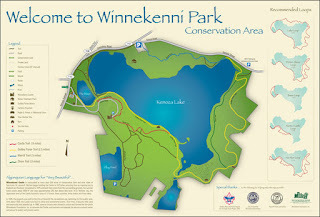 We've spent a lot of time on the trail around the Basin and on parts of the Castle Trail but it wasn't until we looked at the trail map in the book we received that we realized how many different trails there are around Kenoza Lake (and how long some are). We decided to start off on the other side of the lake for a change of pace so we chose the Merrill Trail. We only finished part of it because it was pretty muddy and Tyrion was getting tired. We're definitely going to look into a backpack carrier for him for future hikes so if anyone has any advice on those it would be greatly appreciated. Now on to the pictures because that's the best part. A small brook near the lake. This brook was actually across the street from the trail entrance, you never know where you'll find great little natural nooks to check out. The boys checking out the brook. Tyrion saying, "Come on guys!" just before he threw the stick into the water. The lake from a different angle. The boys were excited to find this wooden foot bridge. He wasn't a fan of the bugs. Tyrion was intrigued by the moss. One of the advantages of homeschooling is the ability to really engage in whatever is most interesting to the child being homeschooled. Davis has always been interested in anything to do with science and nature so when I saw a post on a Facebook homeschool group I'm a part of about a class on rocks and minerals, I immediately said we'd be there. This class was planned and scheduled by a fellow homeschool mom who has boys very close to the same ages as my boys so I knew this would be a great one for Davis and Tyrion. Of course Davis got a lot more out of it than Tyrion but it was still fun for Tyrion to have the chance to touch and pick up a variety of different rocks and just be around other kids learning things at the same time. Between Davis and I we took a lot of pictures so I'm going to let them do most of the talking for us. First up are pictures of the tools used to mine rocks and crystals. The kids each got to choose a few rocks from this bin and Jim, the man running the class, told them what kind of rock they had and explained a few of the qualities and uses for each rock. And yes, they got to bring them home. We all learned that mica is used in both microwaves and hair dryers to insulate the heating elements. And Tyrion just thought it was fun to look through. 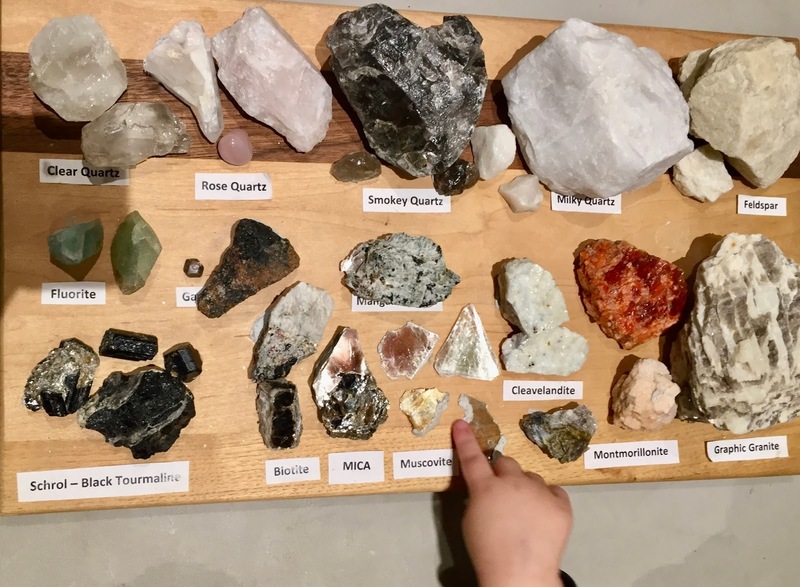 This board held a wide variety of the rocks he talked about. And this one showed the difference between raw, unfinished rocks and their polished counterparts that would be used for jewelry or decorations. These look like ordinary, though very pretty rocks. Until you shine a blacklight on them, they're naturally fluorescent. These were some of Davis' favorites. 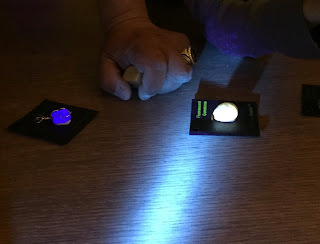 This class was taught by Jim Pecora who is a Crystal Rock Artist, Author, Lecturer and Miner. 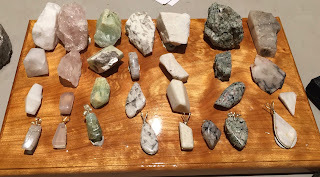 You can see a selection of the crystals, rocks and jewelry he has for sale at Crystal Rock Arts. Earlier this week, Davis and I attended a program at one of the local public libraries on the topic of Native History and Culture in our area. It was presented by members of the Mashpee Wampanoag tribe, Hoban Sanford (Many Walks), his sister Millie (Mother Wolf) and their cousin Sly Fox. A few things really stood out to me during the presentation, mostly that this is a portion of this country's history that is often overlooked or glossed over in schools. I don't remember learning very much about Native Americans in school beyond the fact that they were helpful to the pilgrims. I think it's important to study all aspects of history, not just the pleasant parts or the parts that make us feel good about our ancestors. The other thing that stood out to me was some thing Sly Fox said about why he no longer calls himself Native American. He said he has had discussions with other people who claim to be Native Americans as well because they were born in America, which sounds reasonable. So now Sly says he has Pre-American ancestry. While Davis found some parts a less interesting than others, he was completely fascinated by all the things they brought to look at and touch. He has also started reading through the stack of books we brought home from the library on Native American myths and folktales as well as the history. Honestly, the pictures I took will do a much better job of showing what we saw than I could describe with words. way we would use a flag. This basket is made of pine needles! the hair and stuffing are buffalo hair. Dried gourd made into a whale. The stitching for the Seminole patchwork. Collection of jewelry and other regalia pieces. Details of one of the pipes. Bows and a quiver of arrows. Closer view of the quiver. It's really exciting to me that this one time event has really sparked Davis' interest. There is an inter-tribal pow wow locally this fall and we are already planning to attend. I'm really interested to see all the great projects we can come up with as we delve into this portion of history. We've already discussed making our own dreamcatchers and walking sticks and Davis would really love to make his own bow and learn to use it. 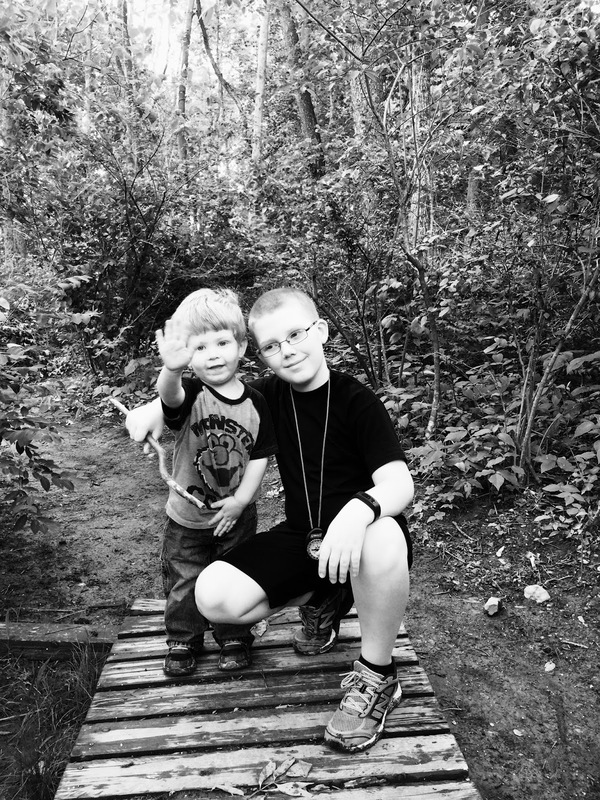 He earned his Whittling Chip in Cub Scouts this past year so he's excited to start carving his own walking sticks. This experience has shown me that one of the best ways to get Davis (and possibly other kids) interested in something new is to find a way for them to see and touch real objects that help them relate to the topic at hand. 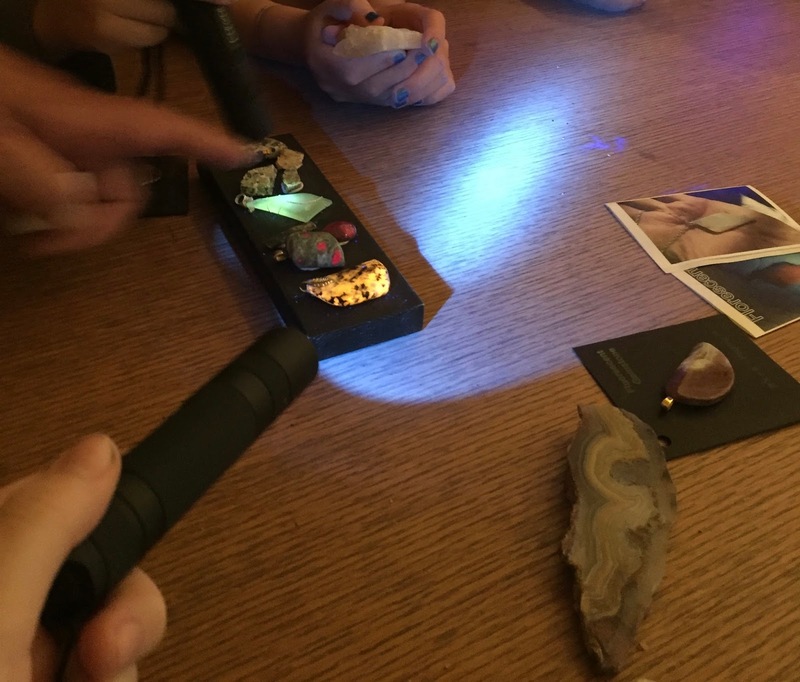 I see a lot of museum trips, outdoor adventures and hands on science in our homeschooling future. This particular experiment was put together very quickly and was not a favorite for Davis. The end result was quite goopy and a little slimy, he doesn't like handling things with that texture so definitely keep that in mind if you plan to recreate it at home. We found this experiment at Science Fun. They have a lot of fun looking experiments that we plan to try in the future so be sure to check them out if you like the ones we've done before. We'd love to hear what you think and get some new ideas for experiments to try so please leave a comment below. I've been a fan of Jami Balmet's blog, Young Wife's Guide and her podcast, Homemaking Foundations for several months so I was really excited when she started talking about writing this book. I'll be completely honest and say that the Proverbs 31 woman has always been intimidating to me. She's alway held up as this ideal Christian woman whom we're all supposed to be working to be like and the way she's described makes it seem impossible to fit that standard. After reading Jami's book though, I realized that the description in the Bible of the Proverbs 31 woman is a description of her entire life's accomplishments, not a list of things that she accomplishes every day. This understanding alone makes here much less intimidating because I can then look at my whole life as the time I have to do all of the things that God has called me to do. There are seasons of life where we may feel like we're not accomplishing much of anything and that's ok. We all have seasons of great accomplishments and seasons of rest. Another thing that Jami talks about that really helped me was that we're not all called to do all of the things the Proverbs 31 woman did in her life. Each one of us has specific callings given to us by God that He wants us to be working on but we're not called to do everything. In The Proverbs 31 Homemaker , Jami discusses the six characteristics of a wise woman: her character as a wife, her devotion as a homemaker, her generosity as a neighbor, her influence as a teacher, her effectiveness as a mother, and her excellence as a woman. Each of these is discussed in the book and they can all apply to each of us. I really enjoyed reading this book. Though it was a quick read, it truly helped me understand the Proverbs 31 woman better and taught me new ways to apply it to my own life. I would highly recommend it to every Christian woman and at the price of just $4.99, it's so affordable there's almost no reason not to read it. As Tyrion is only 2, we are not doing any formal homeschooling with him yet, it is mostly free play. We have begun being more intentional about making sure he has a wide variety of learning opportunities though. We visit several libraries in the area but the one we consider our home library is the Haverhill Public Library, we spend a lot of time there because they have an great selection of books, a variety of programs for both kids, and an amazing staff. The Haverhill library has two different programs for Tyrion's age group on alternating Mondays. One week they do a lapsit story time with books, songs and some fun additions to keep the kids moving and interested. The opposite week they do a program called Little Explorers which is Tyrion's favorite. This program is always something different but it's all based on sensory play. They've done playdoh, textured balls, a variety of car tracks, wrapped things in aluminum foil for the kids to unwrap, water play and many other things. Playing with boats made from pool noodles. The Little Explorers program is one of my favorite things because it's an opportunity for Tyrion to try new things without Matt and I having to spend money on supplies or do a lot of prep work just to find that he's uninterested or dislikes whatever the activity is. I often find myself wanting to recreate the activities at home but there are times when something I think he would love is just not interesting to him. Something else we love to do at any library we visit is try out their collection of puzzles. We have some at home but it's great to try out new ones, it keeps him from getting bored with what we have and saves us from spending a lot of money on things he will soon outgrow. Playing outside at a soccer field. In addition to visiting the libraries, we love to spend time outdoors whether in our own backyard or hiking on some of the local trails. This gives us all some exercise and provides an opportunity for Tyrion (and Davis) to pick up, look at, touch, smell and occasionally even taste if we're not quick enough various plants, rocks etc. 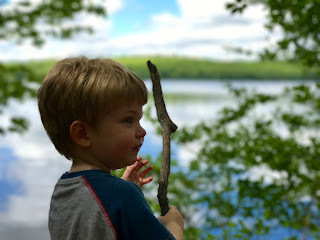 We've seen some really cool animals like Bald Eagles, chipmunks, rabbits, deer, turkeys and ducks in out explorations and I think it's really important for both boys to see as many animals as possible in their natural habitats. Playgrounds are another outdoor space we spend a lot of time at. This provides both physical activity and interaction with other kids. The slides are one of his favorite things. at home too. We have a lot of toys and books available for him to play with but he sometimes gets bored with them so we'll rotate them, putting some away and bringing them out again when he's bored with what's out. A book and a toy in one! We sometimes try out the activities we've done at the library programs or come up with our own fun things to do. He enjoys coloring, painting, playdoh, puzzles, reading, singing and playing. Tyrion also gets to tag along on lots of Davis' homeschooling adventures. While he's obviously not learning the things Davis is, he's still absorbing a lot and just enjoying being included. In the future, I'll be writing about some more of the specific activities we do with Tyrion as part of his learning at home adventures.